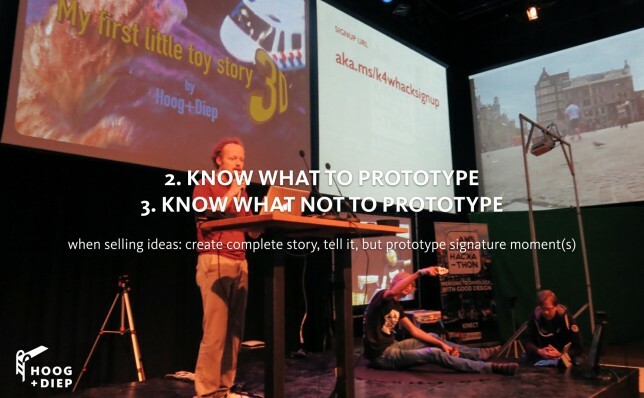 The most important question you can ask yourself when thinking about prototyping is why do you want to create the prototype? Do you want to get feedback on your concept from potential users, test a technological solution or for instance sell the idea to a client? Knowing the answer to this question will be great help in making smarter choices in allocating time and resources. Often there is not a single answer, but make sure everyone on the team knows which are the most important reasons. Once you know why you prototype, it is much easier to make a (preliminary) decision on what part of your product/service design to prototype and what part not to. 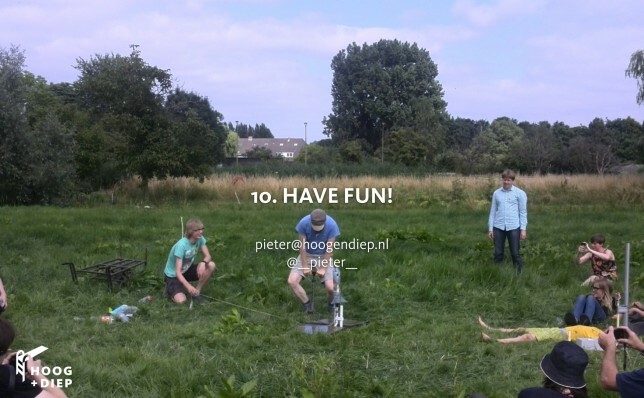 Since you (the students) will be prototyping to “sell” your concept to an audience at an exhibition I will show you a common approach we at Hoog+Diep use. 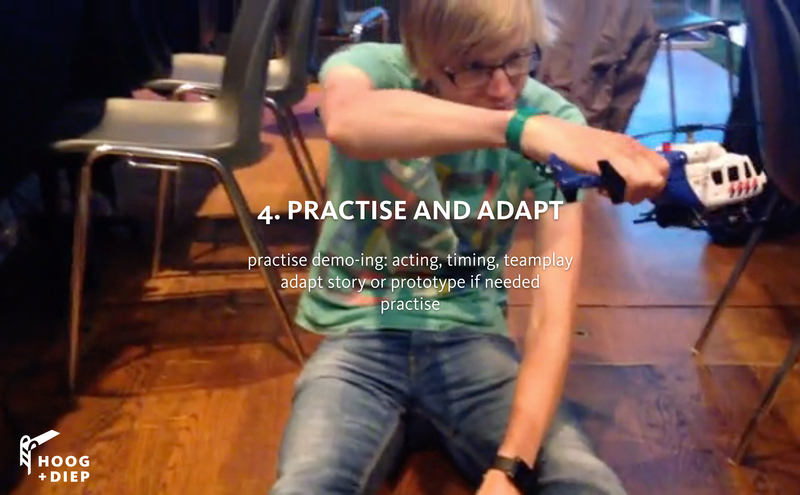 Once a concept, story and prototype plan are in place the team can split up to work on the individual parts. At the same time you want to make sure you keep iterating the demo as a whole as well. We use dry runs for this during prototype development to test the interplay between prototype and story and get a feel for the possibilities of the prototype. This often results in changes to the story to fit the prototype or the other way around. Once we are in front of our audience we want to be comfortable with our prototype and tell our story with confidence, the right timing and interplay between team members. As you might have noticed getting to a full experience (how ever rough) quickly and iterating from there is key to the way we work. That’s also the reason we have lot’s of prototyping material laying around our studio. Some may call it junk but it allows us to flush out an idea quickly and saves us both a trip to the store and money otherwise spent on materials. This is not to say we don’t make polished prototypes using milling machines, 3D printing, robust code, high tech sensors, etc. 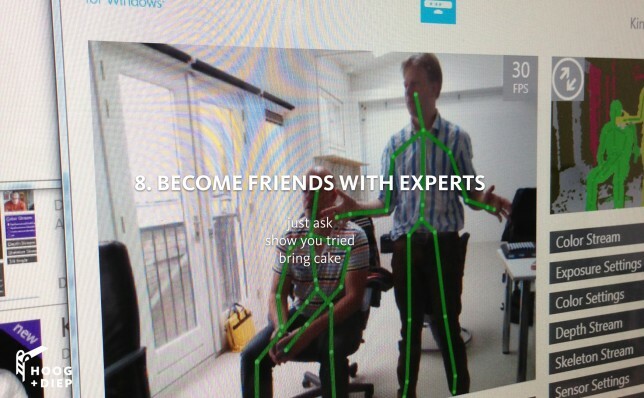 But we always try to make the prototype as realistic and autonomous as needed for the reasons we identified in tip 1. Which brings us to tip number 6. 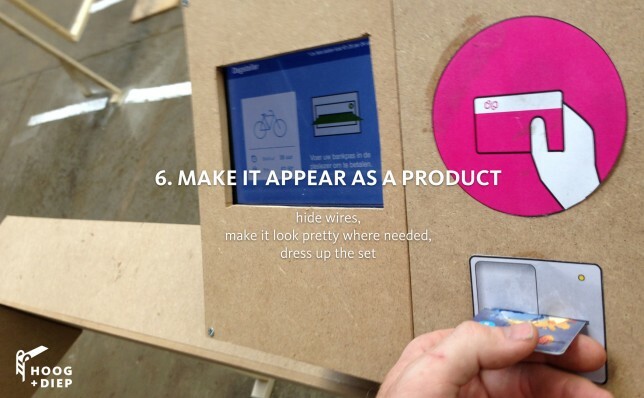 Hoog+Diep’s prototype of the Automatic Bike Parking facilities used the right amount of realism to have participants use it freely during a test. The more a prototype resembles the final product in a realistic setting the more convincing it will be. You can work on the appearance of the prototype and make it behave autonomous. But again, try to focus on the aspects that have the most positive impact for ‘raison d’être’ from tip 1. When working on our prototypes we try to work towards a good overall first impression and polish in more detail at the signature moments. We start by carefully selecting a fitting location while we hide wires, disguise devices and apply paint where needed. Convincing an audience of your concept with a prototype is about more than just the prototype and your story. It is also about creating the right mood to tell it, so if the team members have skills to make this happen use it. You will be amazed what the right set dressing, smells, sounds, lighting & food can do for you. 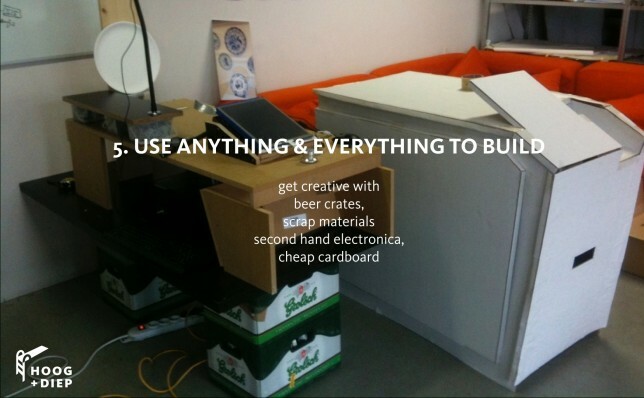 Sometimes prototypes need specialists to make them happen. 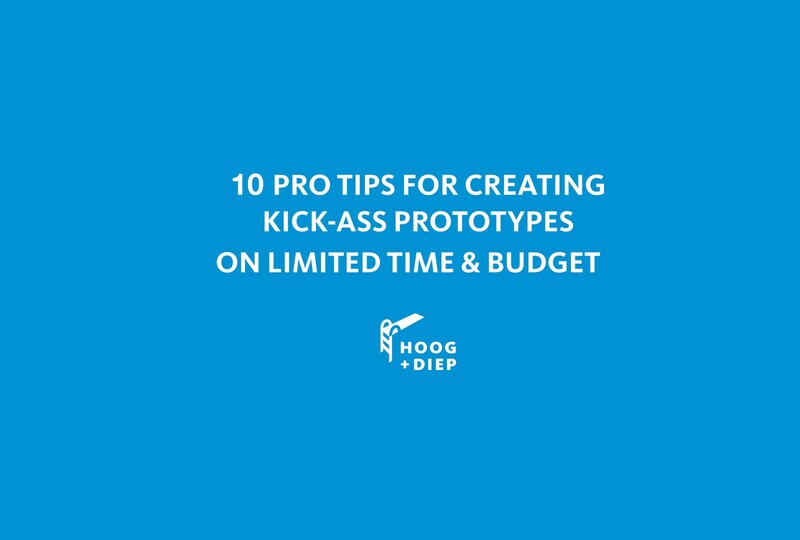 Especially as a starting designer your ambitions for a prototype can be bigger than the time or knowledge you have available. That’s ok, most of the time there are experts (including us) who are happy to share their knowledge and skills with students. Just ask. But be aware that your chance that they help you can be greatly increased by two things: 1. show you tried to come up with a solution yourself. 2. bring cake. 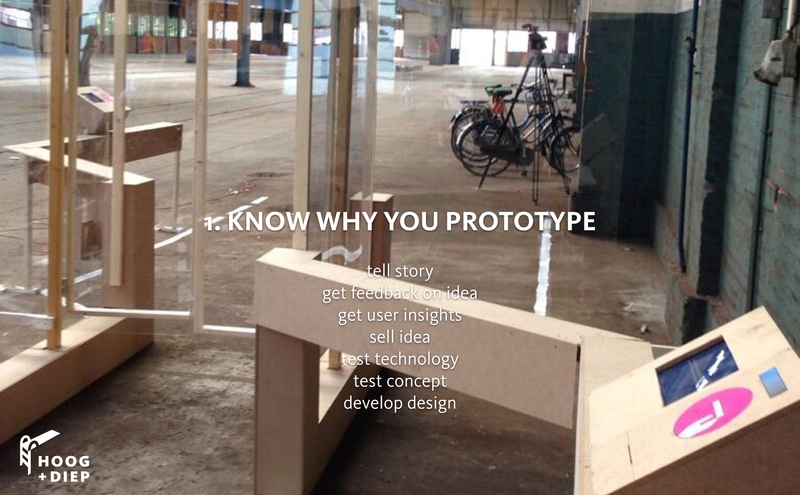 If you want to develop your prototyping skills further the best advise we can give you is make more prototypes! 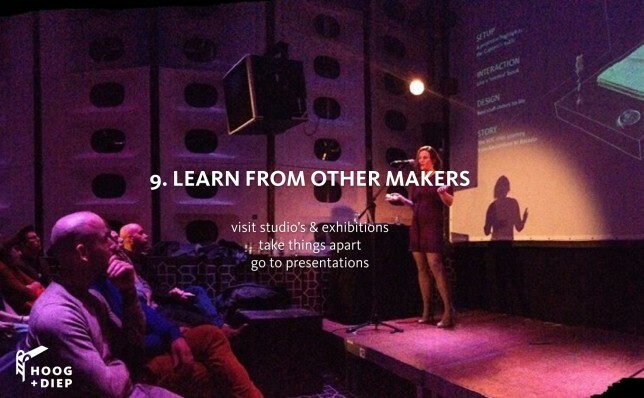 But since you are already doing that, the second best tip is learn from other makers. 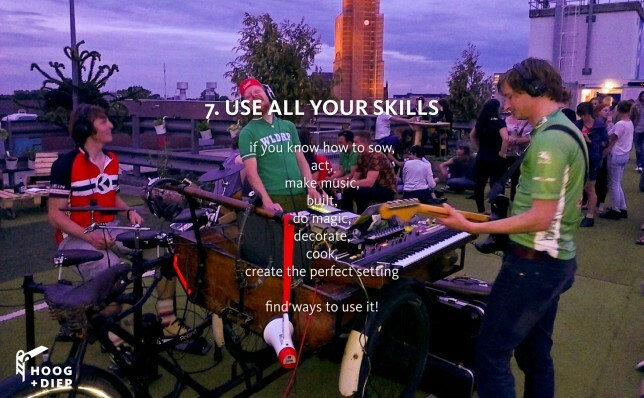 Take things apart, go to meetups (like This happened), visit studio’s, collaborate. You might be amazed that the process of even the most experienced maker is sometimes just as messy as your own. Luna Maurer talking about the making of Your Line or Mine during This happened IXD14. But most of all enjoy it! There is something magical about seeing the thoughts in your head come to life and being able to hand them over to a stranger. If you are missing something or are looking for some expert advice, don’t hesitate to contact us.